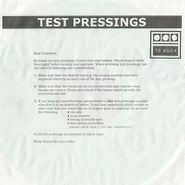 Another heavy entry in DD's Test Pressing series. A-side "Fail" is a lumbering, VHS-sample laden beast which hearkens back to the duo's initial triptych or releases. "Null Results" explores a recent fascination with classic rave sounds, snatching a robotic breakbeat loop and hoover-esque synth. The track starts hard but is slowly pulled apart. Distant motorcycles speed between the rapidfire hats.